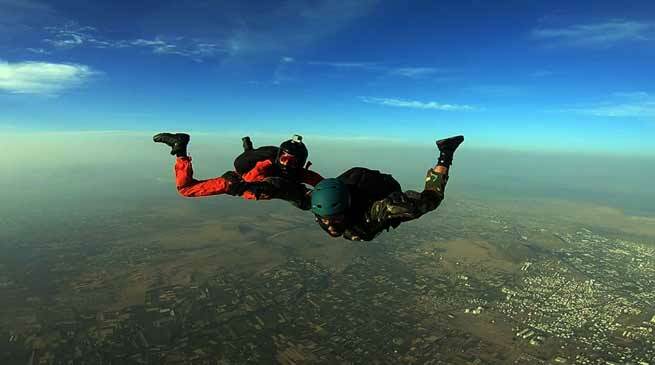 first ever Skydiving jump by Battle Casualty Veteran Major DP Singh, a Kargil War veteran was trained by Indian Army to perform a first ever successful Skydive. The first ever Skydiving jump by Battle Casualty Veteran (leg amputee) in India was conducted by instructors and training staff of Indian Army (Army Adventure Wing) on 28 Mar 2019 at Nasik, Maharashtra from a service aircraft from 9000 ft AGL. Major DP Singh, a Kargil War veteran widely known as “Indian Blade Runner” and a leg amputee was trained by Indian Army to perform a first ever successful Skydive endorsing the “Spirit of Adventure” for all disabled soldiers who suffered physical/war injuries in peace and war time. Chief of Army Staff General Bipin Rawat, PVSM, UYSM, AVSM, YSM, SM, VSM, ADC, COAS approved the activity for the officer to commemorate “Year of Disabled in the Line of Duty” and hence started the journey on 18 Mar 19 wherein the officer was trained on First Jump Course which successfully culminated on 28 Mar 19 by safe and successful landing at the Drop zone and witnessed by soldiers and recruits of training establishment at Nasik.